Fuji® Velvia® remains a popular color slide film. It is a slow film -- ISO 50 – that is popular among landscape, macro, and nature photographers because of its fine grain and highly saturated colors. Action photographers would have none of it because of the slow speed, but among most outdoor photographers, Fuji® Velvia® was a favorite. When people ask in Internet discussion groups how to get the bright, saturated colors they associate with Fuji® Velvia® slide film, the frequent answer is to “boost the saturation with the Hue/Saturation command.” Many Adobe® Photoshop® actions that promise a digital Velvia effect also rely on the Hue/Saturation command. The advice on Internet discussion groups is well-intentioned. It is a quick and easy solution, and with many images, you can get acceptable results with a saturation boost that way (especially if you are a novice to digital photography and have not yet developed a discerning eye). But there are problems with trying to make colors “pop” with Hue/Saturation. Figure 1. 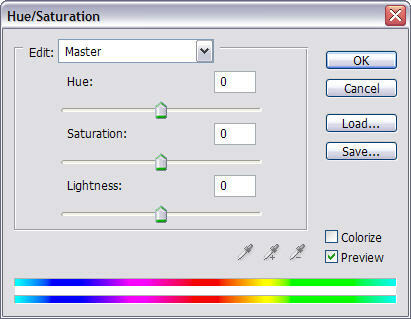 The Hue/Saturation dialog appears to completely separate adjustments to hue, saturation, and lightness. A casual glance at the dialog for the Hue/Saturation gives the impression that it completely separates adjustments to hue, saturation, and lightness. Unfortunately, it does not. Saturation adjustments can also affect image lightness. You can get some significant luminosity shifts when you use the Hue/Saturation command. Figure 2. 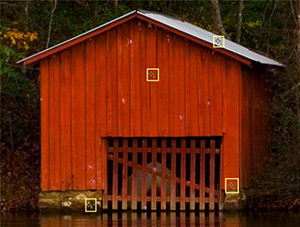 A crop of a red boat house with four color samplers. Figure 2 is an unsharpened crop of an image of a bright red boat house with autumn foliage reflecting in the backwater to a dam at Desoto State Park in Alabama. Color samplers were added in four places to show what happens when Saturation is changed in isolation. Figures 3a and 3b show the results of applying a +10 and +40 Saturation adjustment to the image. Even for the bright white roof, the luminosity changed. So did the hue. The change in the “b” channel, a negative change, means the white roof became ever so slightly more blue. (In L*a*b, negative numbers for the “a” and “b” channel are cooler, positive numbers are warmer, and 0 is neutral). Figures 3a and 3b. The effects on luminosity from +10 and +40 adjustments to Saturation on the Hue/Saturation dialog. The L*a*b “L” channel has been highlighted. The Hue/Saturation command has a couple of additional weaknesses. 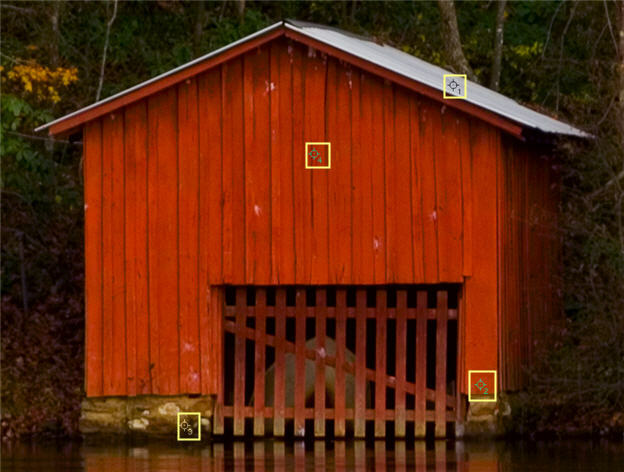 If you retouch JPEG images, you will find that significant changes can emphasize JPEG artifacts. Large adjustments to saturation will introduce other artifacts, too, like posterization and loss of image detail. Applying saturation changes to the individual color ranges will not eliminate the weaknesses in the Hue/Saturation command. They are inherent in the tool. Here We Go! Better Hold On To Your Hat! A better approach for a Fuji® Velvia®-like effect is to make a temporary switch to L*a*b mode and apply the Photoshop Curves command to the “a” and “b” color channels. The L*a*b color model separates color and luminosity completely. This allows us to isolate tone and color manipulations. Neither RGB nor CMYK can do that. All of the luminosity in L*a*b is captured in the Lightness channel. The color channels are the “a” and “b” channels, with the “a” channel placing a color along a magenta/green axis and the “b” channel along a yellow/blue axis. If you have read any Internet discussions about converting to L*a*b, you have likely read that converting from RGB to L*a*b and then back again can cause your image to degrade. This is very unlikely, especially with RGB. 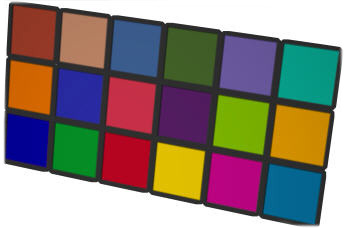 The L*a*b gamut is wider than any RGB or CMYK gamut. The changes needed to add “pop” to the colors in your image can be quite small. Before we move on to a sample image, we need to pause briefly and make certain that your Curves dialog is set to work effectively with L*a*b adjustments. Figure 4. 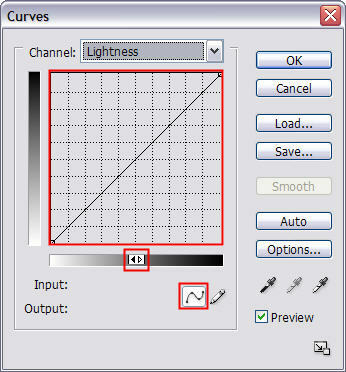 The Curves dialog in Adobe® Photoshop®. If you alt-click on the grid on a PC (option-click on a Mac), the grid will change from 4x4 to 10x10. For nearly any photo retouching, it helps to have Curves display a 10x10 grid rather than the default 4x4 grid. You get more precise control that way. To switch between the two grids, you can alt-click anywhere on the grid with a PC (option-click with a Mac). You want the highlights to display on the left. If your highlights display on the right, just click on the tiny slider beneath the grid. 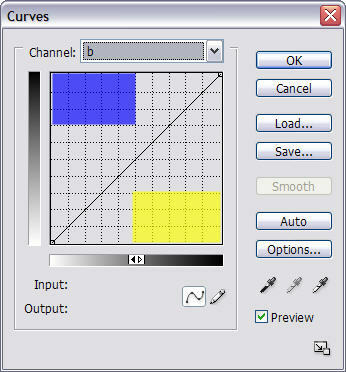 When highlights display on the left, the units for the Curves dialog are percentages, which is more intuitive than L*a*b values, which range from -128 to 127. You want to create a curve by adding points, so make sure the tiny icon for adding points, which is the leftmost icon below the grayscale slider, is selected. You can now add up to 14 points when defining a curve. 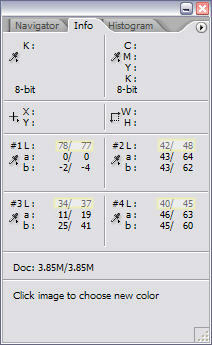 When boosting saturation, we need to adjust only two of the L*a*b channels: the “a” and “b” channels. Leave the Lightness channel alone. Too boost saturation generally, we increase the slope of both the “a” and “b” channels by the same equal amount and keep the midpoint right in the center of the grid. Figures 5a and 5b. The “a” and “b” curves are made more steep by pulling 10 units at both the highlights and the shadows. 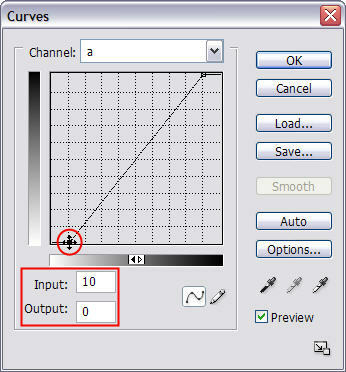 You can click and drag points at the top and bottom of the Curves dialog, or you can click on a point on the curve and then adjust the Input and Output values. To keep the midpoint in the center (and avoid adding a color cast to the image), make sure the adjustments at the top and bottom of the curve are equal. Figure 6. You can finesse the points on a curve by clicking on them and then adjusting the Input and Output values. Figure 7. An unsharpened image of a boat house at dusk, prior to a 10 unit saturation boost via a Curves adjustment to the L*a*b color channels. A 10 unit adjustment to the Master channel with the Hue/Saturation command is a very modest increase in overall saturation. A 10 unit adjustment to the L*a*b color channels is a much more striking increase in saturation. Just compare the original in Figure 7, which is already quite colorful, with Figure 8. Figure 8. Even a colorful image can benefit from a L*a*b adjustment to the color channels to boost saturation. 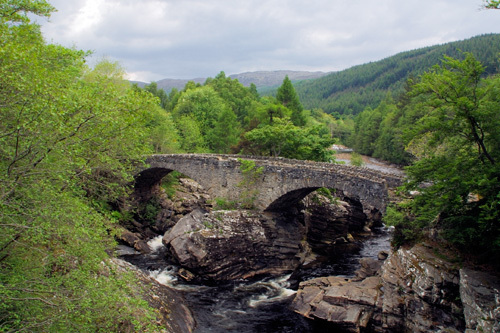 The result is increased saturation without affecting the contrast of the image. The white roof on the building averaged 75 in L*a*b before and remained 75 after the application of the curves in Figures 5a and 5b. If you want a stronger saturation effect, just make the curves steeper yet. Want a less pronounced effect, just pull less on the ends of the curves. What if we want to select a range of colors rather than just increasing overall saturation? A little more knowledge about L*a*b and a little more care with the Curves command is required. Figure 9a and 9b. Colored regions superimposed over the Curves dialogs. Returning to our original image, what if we want to boost the reds in the boat house but not increase the saturation of the green foliage? Here we need to know a little color theory. When we increase magentas and yellows, we boost reds. Below is a pair of curves for boosting reds. Figures 10a and 10b. To boost saturation in the reds, we need to increase the slopes for the lower parts of the “a” and “b” curves. We only want to adjust the lower half of the “a” and “b” curves. So we pin the 50% point on the curves by setting its Input and Output values to equal 50%. We do the same with the 75% point. This will keep the upper right portion of the curve fixed in place as we adjust the lower left corner of the curve. The same adjustment is made to the lower left corners we made in the previous example. Input = 10 and Output = 0 in both L*a*b curves. The result to the reds is quite evident in Figure 11. There is a large boost in their saturation. The saturation of the oranges also increased some. The effect on the yellow autumn leaves is less pronounced. The green vegetation is unchanged. Figure 11. The effect on the image after applying a set of L*a*b curves that boost saturation of the reds. Visitors to The Light’s Right Studio site will find a free download that automates the L*a*b maneuvers described in this tutorial. The TLR Digital Velvia action set will run on CS/CS2 and earlier version of Adobe® Photoshop®. It makes a duplicate of the image, converts the duplicate to L*a*b, makes the required L*a*b maneuver, creates a duplicate layer, and copies the result back to the original RGB file. CurveMeister (see our review) is a third-party add-in for Adobe® Photoshop®. CurveMeister extends the Curves feature of Photoshop. For example, you can display the composite RGB curve plus the individual Red, Green, and Blue curves simultaneously. 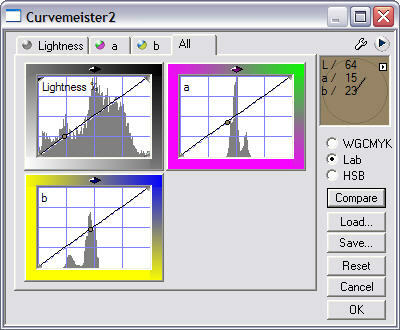 More relevant to this discussion, CurveMeister allows you to adjust L*a*b curves while your image is in RGB mode. Figure 12. CurveMeister, an add-in that gives you Curves on steroids. I compared the results of conversion with CurveMeister 2.0 and the technique described in this tutorial. I used the test image available from www.BruceLindbloom.com, applying a 2 pixel Gaussian Blur to even out the patch values for the simulated Macbeth Color Checker Card featured in the test image. The test procedure was basic. Duplicate the test image. Convert the original from RGB to L*a*b, Use the Photoshop® Curves in L*a*b to increase saturation through equal adjustments to the “a” and “b” curves. Convert back to RGB. Then make the same adjustments to the “a” and “b” curves in L*a*b via CurveMeister o the duplicate. I did this for 10 unit and 20 unit adjustments. Figures 13a and 13b. Crops of the test target from BruceLindbloom.com. The results of converting from RGB to L*a*b and back to RGB are on the left, the results from CurveMeister 2.0 are on the right. The only differences are minor. Just one or two units. Visually, the results are identical. There is a lot to recommend the CurveMeister add-in. But you can easily obtain the benefits of making L*a*b adjustments to saturation and color balance without anything other than Adobe® Photoshop®. 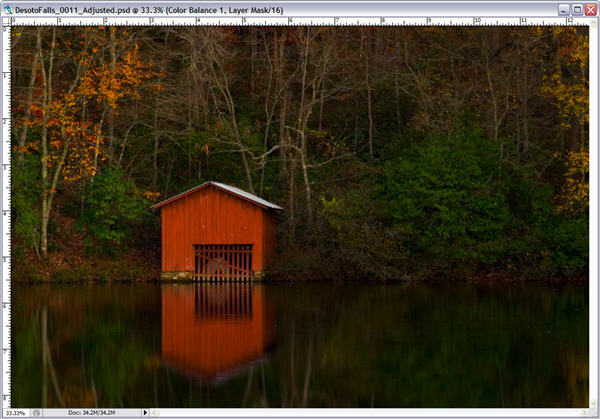 The Hue/Saturation command is a quick and easy way to boost saturation. Unfortunately, there is no way to adjust saturation in RGB or CMYK without also affecting the overall lightness of the image. Adjustments with the Hue/Saturation command can also make JPEG artifacts more apparent. The L*a*b color model completely separates luminosity and color. The trick in creating a digital Velvia effect is to make small, balanced adjustments to the L*a*b color channels. Not only can you add “pop” to an image, you can also reduce the effects of haze. Figures 14a and 14b. Not only can a quick, balanced L*a*b adjustment via Curves add “pop” to an image, it is also an excellent tool for cutting through haze. 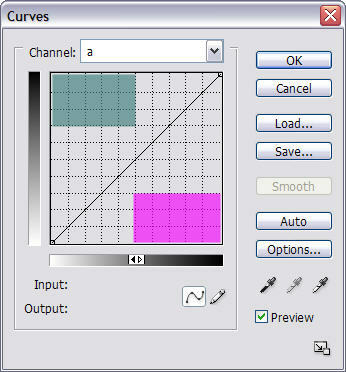 If you want to focus on a range of colors, the Curves command can be used with scalpel-like precision. This requires just a little knowledge of color theory. You can adjust greens or magentas with careful adjustments to only the “a” channel. For adjustments to yellows and blues, you need to focus your adjustments on the “b” channel. Reds benefit from adjustments to the lower halves of both the “a” and the “b” curves. Cyans benefit from adjustments to the upper halves of the “a” and “b” curves. At first, switching to L*a*b is intimidating. Practice on a few images, and you will find that making saturation adjustments is easy. Just pull both ends of the “a” and “b” curves by an equal amount: 5% for a small effect, 10% for a moderate effect, or 20% - 30% to add lots of “pop” to your images without the degrading artifacts that accompany the Hue/Saturation command. f you want to learn more about the advantages (and challenges) of editing images in L*a*b, I suggest you read Dan Margulies new book, "Photoshop LAB Color: The Canyon Conundrum and Other Adventures in the Most Powerful Colorspace." Dan describes this same saturation adjustment and offers lots more helpful advice on using the L*a*b colorspace to quickly (and safely) edit your images.